Surfers ride waves so large that the athletes must be taxied out to them by jet skis. The surfers weave, thread the aqua hills like needles, enveloped in white ocean spray. Their wakes making a crack down the side of a glacier of water. It's an easy-going, laid-back visual to watch. With the cameras capturing the action from helicopters above. Though that angle is a good one, its monopoly lessens the overall richness of this segment. Ice climbers axe their way up a frozen waterfall. Ultimate skiers are dropped at the top of snow-frosted mountains from helicopters. They flow through the powder sugar like a finger through cake frosting. It's simply beautiful. Snow-boarders follow. Wind-surfers drift like feathers in the wind, twirling in the air. Again, an awesome sight. 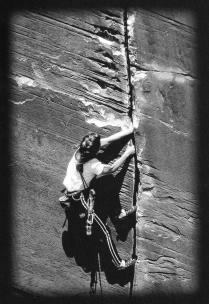 Then rock climbers chip their way along three-inch chasms in red rock. All the segments have a warm natural beauty, but are a bit short on flat out exhilaration because of the lack of POV shots. Additionally, the transition between segments repeats the grainy image of a sea turtle. Already a bit odd the first time, its repetition just seems silly. Then the film very abruptly ends without a proper conclusion. Ringing real and true in the audio, "Extreme" is narrated by the actual athletes and extremists. Warm in spirituality and the beauty of communing with nature, the film tackles personal fears mano e mano by highlighting individuals who find the boldness to place themselves directly in the places they love to be. This is a strong piece; it's only lack is a breadth of camera angles (most notably angles that put the viewer in that sacred place as well). Extreme: An Imax Experience. Copyright © 1999. Produced by Neils de Jong Franken at Saab.